You know how you look at a quilt book and just fascinate at the fabrics, color combinations, patterns which create a visual design, quilt stitching, borders......well, that is how you would describe this month's guest speaker, Cindy Lammon's trunk show. Each quilt that was unfolded for us to see was like turning the pages in a book -- gasping and marveling. And, instead of words on a page, she told us her story about how that quilt came to be. It was a "real" page turner experience! In fact, some of the quilt's she showed were actually from one of her four published quilt books. For all those who know Cindy, she is a delight. As mentioned earlier, she is a member of GMQG, but what we may have not known was how she started quilting. I like how she said it (paraphrased), she grew up around sewing....her Mother sewed beautifully, but sewed out of necessity. It was her Grandmother that sewed for the love of it. They influenced her as well as taught her how to sew. Cindy started out in Nursing. Around that same time, in the early 80's, she signed up for a quilting class. From then to now, her story exponentially unfolds with her first "show quilt" in the mid-80's. 1st Quilt Show - "variation on Log Cabin pattern"
In 2000-01, she published her first book "Gathered From The Garden" which came about after successfully designing "blocks of the month" for a local quilt shop. In 2007, she began her blog called Hyacinth Quilt Designs. It is here, she teaches, challenges and showcases her quilt works. Thank you Cindy for a wonderful presentation----- She did not have "The End" in her story, so that means we will continue to benefit and enjoy her quilting creativity and creations. How does she hang her wall quilts: She uses medium size Command hooks. She inserts a thin piece of wood in the quilt sleeve, then the wood that sticks out from the sleeve she slides on the hook. Plus, Command hooks can be removed! Our Charity Quilt is started. Hurray for GMQG!!!! Hurray to Valerie Kasten!!!! for organizing our Sew-In this past Saturday. Valerie purchased our fabric and then pre-cut it into blocks to be sewed. It made for a very productive time. Thank you Valerie and all who came to assist her with sewing machines in tow. Cheryl Brickey, GMQG President (right) and Johellen George (left) have a joint quilt project featured in the Quilts from Quiltmakers 100 Blocks - Fall 2016. Teaming up, Cheryl assembled the quilt and Johellen quilted it. Their work is exceptional. Congrats to you both! And, Paige Alexander (left) and Cheryl Brickey (right) have an upcoming book with Stash Books. Fantastic!!!! In this phase of their planning, they have asked GMQG to participate in a special quilt project they are doing for the book. Each person who signed up received a packet with a pattern, instruction and material to sew and bring back next month. We definitely have an enthusiastic group. In our busy lives, it is refreshing and motivating to be a part of women sharing their talent. Faye Jones- Quilt show entry "sewing on wool"
Faye Jones is mixing it up for us. Next month, she would like us to bring an already made quilt block that has been shut away never to be incorporated in a project. She believes if we trade-in our shut away quilt blocks maybe someone else will find it inspirational. Can we prove her theory right? We do know the outcome of these inspirations go to GHS Children's Hospital. This month Faye received six (6) quilts from you. Plus, you voted with her to expand our reach to nearby Spartanburg GHS. Thank you for steadfastly making a difference in children's lives as well as the staff at GHS. QuiltCon East – Learn more about the schedule for lectures and workshops. Registration began on June 25th for all MQG members. Remember MQG members can receive a FREE four-day show pass and member discounts, but you will need to sign-up through the MQG registration process to receive the free pass. 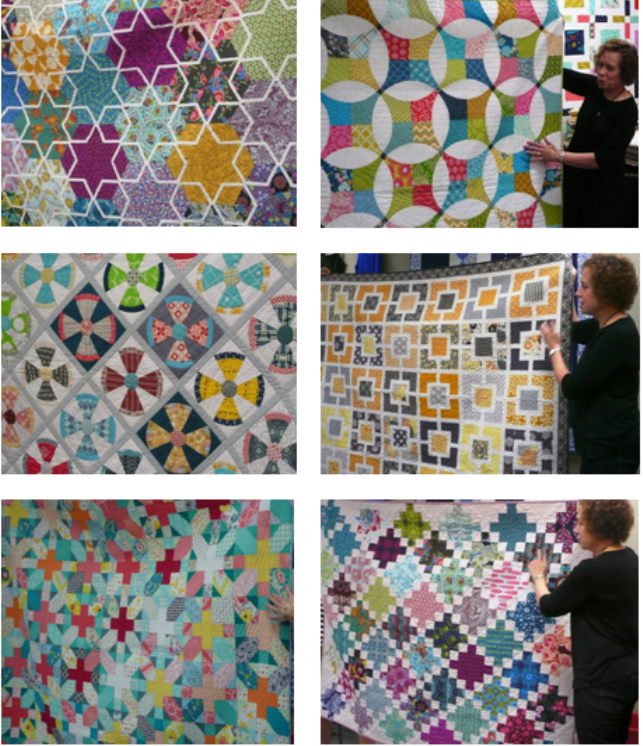 Special Note: MQG has an open call out for the 2017 Quilt of the Month and Block of the Month programs. Submissions are due by September 15th. 9-Patch Challenge....Learn more. Submissions are due November 30, 2016. A Symphony of Quilts - quilt show sponsored by Lake and Mountain Quilter's Guild on September 16 -17 at the Shaver Rec Center in Seneca. PLUS +++Carole Kreson will be showing three (3) quilts here. Quilting in the Pines sponsored by the Sandhills Quilt Guild is September 23 – 24 in Pinehurst, NC. 2016 Aunt Het Quilt Show sponsored by Nimble Thimbles Quilt Guild, October 1-2. Ashville Quilt Show September 30, October 1 & 2 . Welcome... to our newest member this past Saturday as well as to our two guests. We are glad you came to join us. We currently have 52 members with 29 present at our meeting. For our October 8th meeting remember to bring four (4) fat quarters of your choosing wrapped in a package. What is Faye up too you ask.....Well, she is calling it a "Dirty Santa Swap". Come ready for a participatory event. And, if you run out of time, you can always purchase your fat quarters at Bernina Sewing Center the day of swap. Save the Date and plan to come for Cindy Lammon's next Sew-in Day on October 21st at Bernina Sewing Center from 10:00a.m. - 3:00pm. It is a day to enjoy sewing with friends. Snacks will be provided. Membership Dues reminder: We want you to renew your membership for 2017 with us. Paige Alexander will be receiving our renewal dues of $35 in both October & November meetings. She can accept either check or cash. Here is the website to Wild Acres Retreat Conference Center where Faye Jones would like to coordinate a Quilting Retreat. It is a beautiful location near the Blue Ridge Parkway. Be expecting soon, a Survey Monkey, with questions regarding what you would like as a date, retreat activity and more. Our next gathering will be on October 8th from 1:00pm - 3:00pm. We will have lots to talk about with all the Quilt Shows that we will be attending in the next few weeks. Plus, it is that season, to vote for our 2017 GMQG Board, so it is important that we come and participate to make a quorum. And, as mentioned above, bring your four (4) fat quarters for the Dirty Santa Swap.